Art Group Facilitator, BA Drama, BA(Hons) Painting, MA Fine Art. After a career in the theatre Catriona went to Edinburgh College of Art as a mature student having previously worked in theatre and literature. She obtained a Master of Fine Art at the University of Dundee. 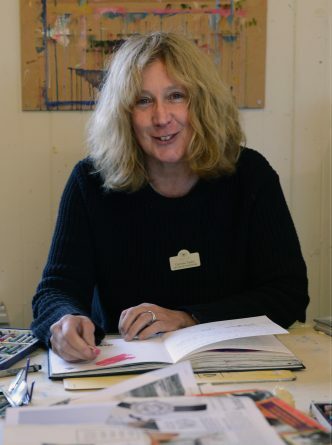 Since then she has had several solo exhibitions, including: The Park Gallery, Falkirk, Amber Arts, Edinburgh; Stanza Poetry Festival in St Andrews; Tweeddale Museum Peebles; and she has been part of a number of group exhibitions including: Cameron Contemporary Art in Brighton, the London and Bristol Affordable Art Fairs; the RSA annual exhibition; SSA and VAS at the RSA Galleries; Gracefield Arts Centre, Leith Gallery and Edinburgh Printmakers. Catriona has been Artist in Residence for the National Library of Scotland making work in response to the collections; with the Scottish Centre of Diaspora Studies at Edinburgh University, funded by a Leverhulme Artist in Residence Award. The work from this residency was shown at the National Museum of Scotland and the Scottish Parliament. She was also Artist in Residence with Craig &Rose, Dunfermline; funded by an Arts and Business Creativity at Work Award.